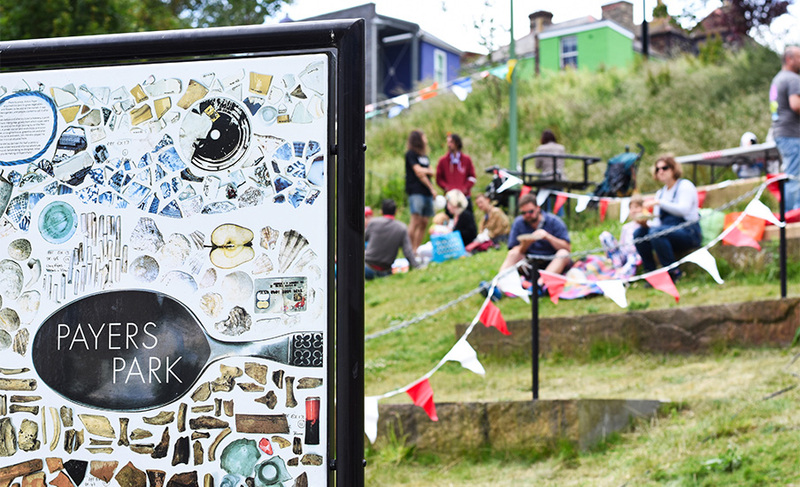 For Folkestone Triennial 2014, muf's community participation-driven design has rejuvenated an area known as Payers Park, which has up to the present been dilapidated and negatively perceived in the town. It has been extensively landscaped and redesigned so as to offer an oasis of green space between the Creative Quarter, Grace Hill and Rendezvous Street, to be used by all sections of the community. muf has worked with many different local groups to carefully design the area for a variety of uses and users, creating a new social space and encouraging passage through the area. As a part of the design process, muf initiated an Open Air Museum event, working with local people and archaeologists on a dig, an open air bread and pizza oven, temporary tattoos by the local tattoo studio and a program of live music, creating a platform to engage the many different constituents of the area. This was followed by a Relics Rap, weaving the archeological report and the story of the previous occupation of the site with the personal stories of the young people who use it now, so demonstrating the tangible link between the past, the existing and the potential occupants of Payers Park. The new park occupies a prime position, and incorporates views through existing mature trees across the sloping site. Amenities include a graded boardwalk and other walkways, seating, planted and grassed areas, and a central plateau, all designed to provide a focal point and destination for residents, visitors and shoppers, as well as improving access between areas of the town centre that are currently disconnected. The current car parking spaces will be retained, but realigned so as to present the entire area more attractively.